Planning on having a summer full of parties, but the current condition of your kitchen is holding you back? Tired of looking at the same old cabinets and fixtures? Are you looking for a quick, hassle-free, cost-effective kitchen transformation? Desirable Kitchens & Refacing in Pittsburgh, PA, has the solution for you. Desirable Kitchens & Refacing has been transforming kitchens in the Pittsburgh and surrounding areas for years. Our dedicated team of professionals works with you to find the most cost-effective and time-efficient way to upgrade your kitchen while adding value to your home. Kitchen remodeling is known to shut down your existing kitchen for months and carry a hefty price tag, but it doesn’t have to. Check out the ways you can achieve your dream kitchen, without breaking the bank! 2. Paint – A simple change in wall color is an inexpensive upgrade that will transform the look and feel of your kitchen. Consider using natural paint or paint with low-VOC or no VOC, which makes your kitchen more eco-friendly, and reduces the number of toxins that can potentially be released into the air. 3. New Countertops – With so many options to choose from, deciding on which type of countertop is best for you can seem overwhelming. To simplify the process, you should consider a surface that matches your kitchen style, meets the needs of your household’s kitchen activities and falls within your budget. Quartz countertops, known for its resistance to heat, scratches, and spills, have become quite popular and are a must-have for a kitchen with a lot of traffic. 4. New Lighting – Consider installing new light fixtures, which can provide a dramatic effect on the mood of your room. Maybe under-cabinet lighting will add that needed touch to highlight newly installed countertops. Whatever your needs are, there are a variety of unique options to choose from when purchasing the right illumination for your kitchen. 5. Accessories – By accessorizing with a few inexpensive items, you can add new life to your kitchen space. Consider adding fresh plants in decorative plant stands or hanging fresh flowers to provide a splash of color. Update your kitchen cabinets with new door handles, knobs or pulls. Add fruit baskets to your table, display scented candles or purchase new window treatments. 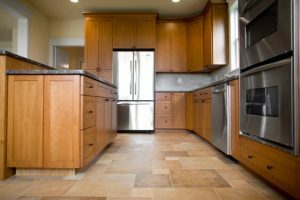 For your kitchen transformation, consider cabinet refacing in Pittsburgh, PA. It is a quick and simple process when hiring experienced professionals, such as Desirable Kitchens and Refacing. From cabinets to countertops, we will guide you through the best options for your kitchen. For a free consultation or more information, call 412-515-0582 or visit.